Please contact us anytime if you would like a free quote on any type of built-in cabinetry project for your home or office. We can design, fabricate and install any type of built-in entertainment centers, office bookcases, office built-in cabinetry with storage, laundry room cubbies with beadboard... etc., etc. You can fill out our ESTIMATE REQUEST FORM, or call us at 703-330-3486 to request a free no obligation, no pressure in home consultation to go over your project. Some of the specifications for this project include: Solid maple veneer ply casework with poplar wood facings, Solid all maple square flat reverse panel beaded overlay doors, solid dovetailed maple drawers, 5" stiles with fluted pilasters with rosettes & plinth details, adjustable shelving throughout, recessed flat panel cabinet sides, and a matching wainscoting on the walls. Custom Built-In Cabinets: designed, fabricated, and installed by Mitre Contracting, Inc.
Built-in Cabinetry - MITRE CONTRACTING, INC. This blog features pictures and information from a recent design, build, and installation of built-in cabinetry, for a client in Reston, VA. This custom set of built-in cabinets is 14' wide and almost 10' tall, and was custom painted by R.K.Morris Painting Company. Some of the features of this built-in cabinetry project include: The casework of the cabinets is solid 3/4" maple veneer plywood with poplar wood facings (stiles & rails), the doors are an 1/2" overlay design using reverse flat recessed panels, concealed soft closing "Blum" brand hinges & all solid maple wood construction. This homeowner wanted to have glass shelves in the open bookcase sections, that will get accent lighting. All the wood shelves in the storage sections are adjustable. This built-in project has 5" wide stiles with 3" fluted pilasters on both the upper cabinetry and the base cabinetry, with plinth blocks and rosettes. This client wanted the rosettes to be plain with no circular cutouts. The straight valances on the upper bookcases have applied panels... with the center valance having an integrated wood vent to accommodate an existing AC vent. This built-in entertainment center has a 65" wide space for the television screen. This cabinetry features recessed side panels in both the upper and lower cabinetry on the exposed right side. This blog entry features a built-in cabinetry project we just completed awhile back for a Fairfax, VA homeowner. These custom bookcases and cabinetry were designed, fabricated, and installed by Mitre Contracting, Inc. These built-ins and bookcases were hand painted after the installation by R.K.M. Painting Company. The built-in counter tops are made from 3/4" maple veneer plywood with 1.5" wood edgings with a bead profile. The built-in base cabinetry storage units are a flush toekick design wrapped with a baseboard that matches the baseboard in the home. See the picture below for a close up view of the built-in cabinetry base unit's recessed paneled sides. This next picture shows the custom built-in file drawers, showing the dovetailed construction and the 200 lbs full extension slides. These will hold either legal or letter sized files in a lateral position. The drawer boxes are constructed from a solid 5/8" maple and come with a nice lacquered finish. They come with matching all maple recessed panel drawer fronts. This next picture shows a close up view of the custom built-in cabinetry base unit's interior. This base cabinet comes with one full depth adjustable shelf and overlay solid maple recessed panel doors. These base unit cabinets can also come with inset style doors, raised panels, arched panels...etc. if desired. The interiors get a couple coats of a clear polyurethane finish. The doors also come with "Blum" brand euro style hinges that clip on style and are fully adjustable. The next two pictures below show close up views of the upper bookcase shelving units. Here you can see the built-in cabinetry's recessed panel sides, adjustable shelves, plain stiles with cabinet beading, the straight valances and crown moulding at the ceiling. I originally designed these built-in cabinets with a shelving unit over the seating desk area, but this homeowner wanted to hang some artwork and deleted the middle section of shelves from the original design. This next picture shows the units right after the installation before they have been painted. The full height bookcase built-in units feature all adjustable shelves, straight valances, plain stiles, and a flush toe kick design. The bookcases are trimmed out in baseboard and crown moulding that match the homes mouldings. Here we would like to highlight a few past stair railing projects that have wrought iron balusters. Iron balusters have a classic time tested look that stands out from the ordinary. Wrought iron balusters come in hundreds of styles, sizes, and colors to suit most anyone's design style. In this blog I would like to feature some of the most popular wrought iron balusters and baluster layouts most customers request. This first set of stair railing pictures include boxed newel posts, 6010 style railing and a layout of plain iron balusters and single knuckle iron balusters. The color is a semi-gloss or satin black finish. This next set of pictures shows an oak stair railing system utilizing wrought iron balusters with scroll and double twist designs in satin/semi-gloss black. Stair rails with wrought iron balusters... interior trimwork & mouldings by Mitre Contracting, Inc. There are virtually unlimited stair railing designs, balusters, and baluster combination layouts you can choose. See this page on our website for links to several stair parts manufacturer's websites and catalogs. To work on your own stair railing design, go to this page, choose the "Stair Artist" tool, and you can choose your stair type, newel posts, and baluster type... then play around with the layout until you have something you like. The above pictures have been just a small sample of what is available to you. Please call or email us anytime for your in house consultation and free no-hassle estimate on your stair railing renovation. Manassas,VA USA, January 15, 2015 – Mitre Contracting, Inc. of Manassas, VA has been awarded “Best Of Houzz” for Customer Satisfaction by Houzz, the leading platform for home remodeling and design. The 32 year old custom finish carpentry company was chosen by the more than 25 million monthly unique users that comprise the Houzz community from among more than 500,000 active home building, remodeling and design industry professionals. 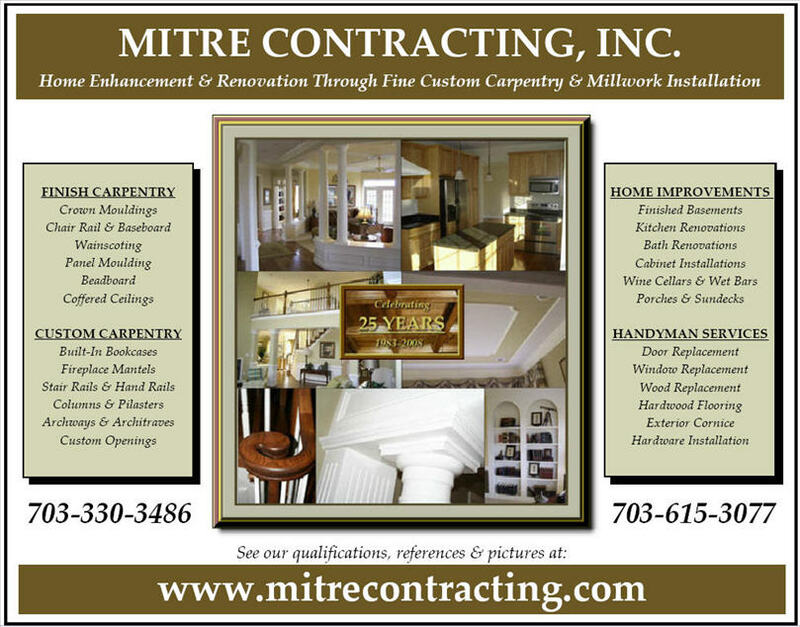 Mitre Contracting, Inc. is a fully licensed and insured finish carpentry contracting company serving Northern Virginia and surrounding counties since 1983. Whether it's a single room of crown moulding or chair rail, a stair railing replacement, custom built-in cabinetry, archways, mantels or coffered ceiling treatments, we can transform & update the look and atmosphere of your home. This finish carpentry interior trim work project was installed for Quaker Custom Homes in Northern Virginia. All the mouldings & millwork was provided by Accent Millwork. You can see more pictures of this custom home on Quaker Homes facebook page HERE ... they are a lot better quality than mine are! The baseboards are WM-163E fjp, The windows are trimmed out with wood jambs, wood sills and WM-445 fjp casing. The 2 piece chair railing consist of a LWM-304 backer with a LWM-302 chair rail. The 3 piece crown molding is made up from a WM-49 fjp crown mould on a WM-753 beaded backer with a Wm-167 neck moulding. In the Dining room, Foyer and Hallway we installed a shadowbox panel moulding of LWP-184 under all the chair railing. The custom cased openings are MDF construction with arched headers, fluted above the chair rail and applied panels under the chair to match the shadowbox wainscoting. The stair railings are an (over-the-post) & (post-to-post) system consisting of 6010 oak railings, 4010PT & 4010MT red oak newel posts, with wrought iron balusters featuring an alternating layout of single baskets and double knuckles in semi-gloss black. Just a short blog to show some pictures of a custom stair railing installation we completed last year 2014 for Quaker Custom Homes in Northern Virginia. This stair railing features painted boxed newel posts and painted square balusters with a stained oak handrail. This stair rail installation was part of a whole house interior trim finish caprentry project for a custom built home. This first picture shows the main staircase looking up from the foyer to the second floor. Here you can see the painted boxed newel posts with square tops and square mouldings, the stained oak 6010 style railings, and the painted 5060 style square balusters. All the newel posts are installed using the "suretight" newel bolting system... a 1/2" x 12" long bolt that gets bolted into the floor joist and then tightened down with a 3/4" wrench. This makes for an exceptionally strong installation. We have been installing stair railings for over 30 years, and during that time have tried pretty much every type of installation method we could think of, and this system beats them all hands down. Have been using them for years and years and never had a callback because a newel post came loose. Very important to check with your contractor to verify how they plan to secure the newel posts and balusters on your stair railings! Those little brackets the big box stores sell for newel post installation are toys compared to using a 12" long 1/2" thick bolt. This stair railing installation was completed in 2014 in Manassas, VA, in Northern Virginia. Along ,with Mitre doing the stair railing installation we also installed all the other finish carpentry for the house. This included installing all the interior doors and casings, the window sills, aprons and casings, baseboards, crown mouldings, char railings... etc. Mitre also installed all the kitchen and bath cabinetry along with all the hardware installations. All the interior doors and 1st floor windows got entablatures consisting of 1x6 with 1x2 cap and bead moulding. Please call us anytime if you would like a free estimate for all your finish carpentry needs, or you can fill out our estimate request form here and we will contact you shortly. This finish carpentry project was completed for a homeowner in Sterling, VA. The project features custom painted built-in cabinets and mantels. The upper built-ins are open bookcases with adjustable shelving. The base units feature inset (shaker style) flat panel doors. The bases of these paint grade built-ins are constructed of a 3/4" thick maple veneer plywood, the facings (stiles & rails) are made from 3/4" thick solid poplar & maple. This homeowner wanted the doors to have a shaker / craftsman style look so we went with a flat square recessed panel. These are again constructed from solid maple with a 1/4" maple veneer panel. The cabinet doors are an inset design ( they sit in flush with the stiles & rails), versus an overlay design. The built-in cabinet doors feature "Blum" brand concealed hinges that clip on and off and are 3 way adjustable. The upper portion of these built-ins feature open bookshelves. The bookcase shelves are fully adjustable and removable. The front stiles and valances are a straight smooth plain design. They include a special custom cabinet beading detail that puts on that finishing touch. The shelves are constructed from a 3/4" maple / birch veneer plywood with a front solid wood edging of maple / poplar wood that has a milled beaded profile. This is a close up picture of the custom made mantel. This fireplace mantel features plain pilaster legs in keeping with the craftsman style look of the finish carpentry remodeling project. The crown moulding used is a nice beaded cove and the breastplate is also smooth and plain. We fabricated a solid 3/4" veneer maple wood panel above the mantel giving the space a nice recessed panel look... using the same beading detail as the bookcase stiles and shelves. Here is another close up view of the mantel in the living room between the built-in cabinets. Below is a close up view of the "inset" style cabinet doors that create the lower storage areas. The doors have a plain flat recessed panel design. These could also have raised panels, beaded panels, arched raised panels... etc. Every aspect of the construction and style can be customized to any particular design or functionality. Below is another close up picture showing the stiles of the upper bookcase portion of the built-in cabinetry. The cabinet stiles are plain... versus fluted, paneled, reeded, rounded...etc. I like to use the added cabinet bead detail on the stiles, shelving and valances. Notice that the shelving is adjustable by way of the 5mm holes indexed up each inner side of the bookcase casework. These utilize small metal pins that in turn support the shelving. This next picture shows another mantel we fabricated for the same Virginia homeowner. This fireplace mantle features the same clean plain design style in that it has smooth pilasters, a plain breastplate and a nice clean beaded cove crown moulding. Please contact us if you would like a free no pressure estimate on a custom set of built-in cabinets or a fireplace mantel. We offer our finish carpentry services throughout all of Northern Virginia and several surrounding counties. Finish Carpentry services we provide include all types of moulding / molding installations (baseboards, crown moldings, char rails, shadowboxes, wall panels, window & door casings), stair railings (railing replacements & installations), archways, built-in cabinetry, built-in bookcases, wainscoting, coffered ceilings...etc. etc. Mitre Contracting built and installed my custom living room fireplace mantel and built-in bookcases (also my family room fireplace mantel). The built-ins are stunning. Roger (the owner) was great. He is very conscientious and a very skilled carpenter. They are reliable and very reasonable in price. We are very pleased and will use him again and again (I would have built-ins in every room if I have my way). In this posting I feature several pictures of a recently completed home where we installed the finish carpentry. This home was called the "Barn House". The pictures should speak for themselves as to the design style. We installed close to 5000 feet of 1x8 in this home. In this home we also installed all the interior doors, crown mouldings, baseboards, ceiling treatments, wall treatments, 1x8 horizontal wainscot, reclaimed barn wood wainscoting, window seats, banquette seating, window casings and the half walls, columns and beams. The stairway in this house featured a center wall we wrapped in reclaimed barnwood. The stairway also features custom floating stair treads of reclaimed barn wood with recessed custom lighting. The exterior walls of the stairway got vertical and horizontal 1x8 wall treatments with a accented strip of siding.